Ruby Tuesday is a meme for all photos of red in color. With the aftermath of H’cane Irene, I’m happily sitting her in Panera bread for the free internet connection and electricity. This week, I’m living like a farm girl or of the 19th century; that is up at dawn with the sunlight, do my chores as the light shines in the window,and candles or a flashlight at night. 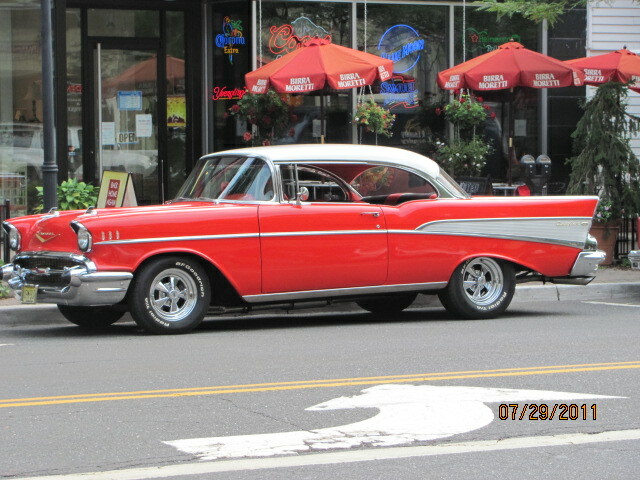 If what you’re craving is some nostalgia, you can look for your favorite 1950″s antique car while strolling along Main street in Somerville on a summer night and catching a concert on the lawn in front of the Courthouse building. 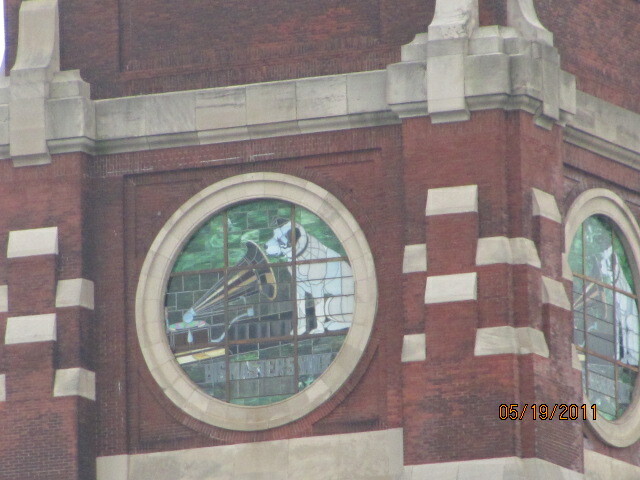 Stained Glass on the top of the former RCA Victor headquarters, the “Nipper Building” ( #17). The above R.C.A. image is a blast from yesteryear. Businesses have changed with the influx of foreign-made products, but I’m glad that the building was saved. The architecture is all brick,and on closer inspection of the image of the “Nipper”, the Fox Terrier turning his ear to the Victrola, it is is made of Stained Glass. Chicago skyline reflected in "The Bean". Friday, welcomes the weekly event of “Skywatch Friday. 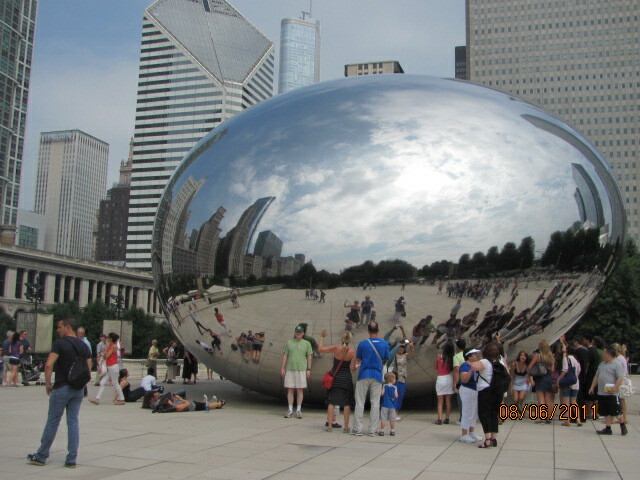 We recently spent two days of our vacation in “the Windy City” of Chicago. There is so much to see and do, that we had to select from one or two of our ideas. millenium Park was very close to the Chicago Fine Arts museum. 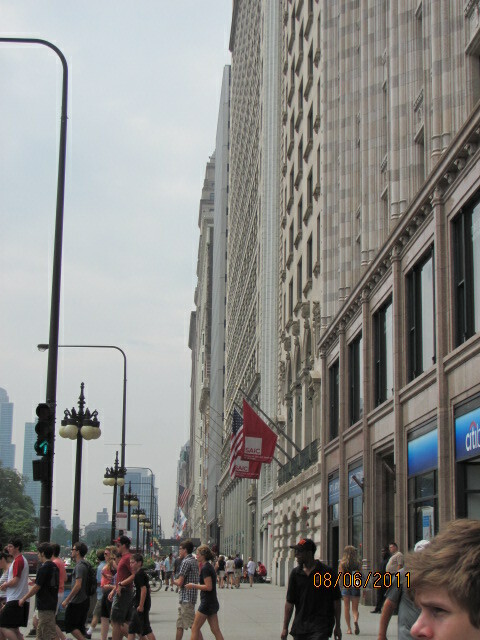 After parking in an underground parking garage, we crossed Michigan Avenue where we could see the throngs of people walking to the great “LalaPolooza music festival that was going to take place all day and night. 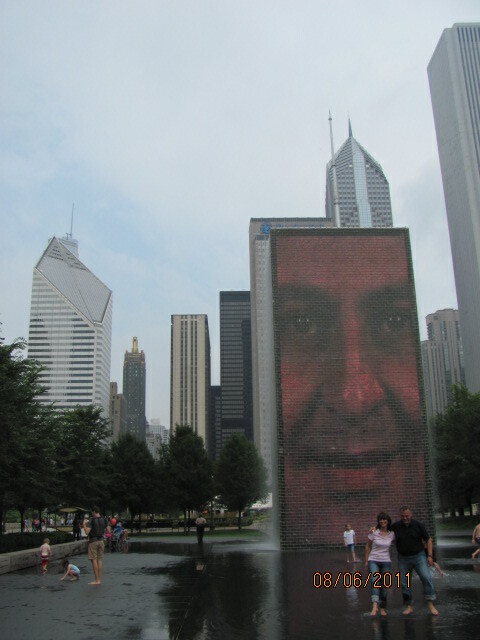 The Tower fountain in Millenium Park is composed of brick and has digital photo images of one face that gradually fades and changes into another every few minutes. We stayed there for many minutes watching all the people, especially children , running and splashing through the overflow of the fountains’ water. The "face" in the Tower Fountain! 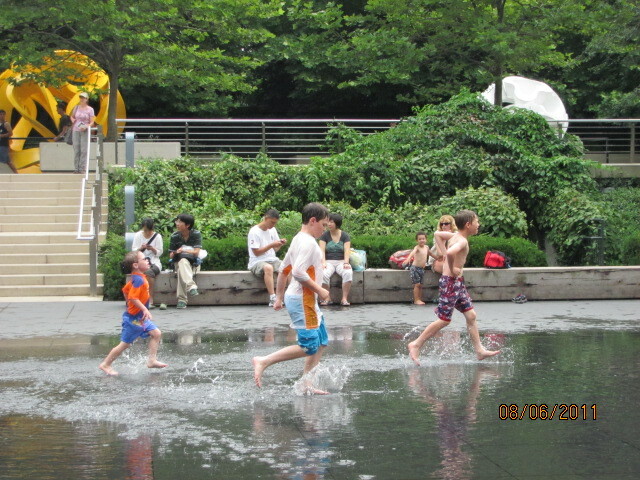 Oh, to be young and carefree like this to run through the fountain's water! Good morning everyone. Each week on Saturday, there’s a blog host, Beverly of “How Sweet the Sound” where you link up to share your photos in pink. http://howsweetthesound.typepad.com/ Today, I’m excited that we’re going to Collingswood for their Farmer’s Market. We last visited in the month of May primarily to go to The PopShop. The Pop Shop is a retro place with fountain sodas of many flavors, make-your own combinations , ice cream sundaes, and delicious burgers and fries topped with cheddar cheese and bacon if you dare. Walking along the pretty tree-lined Main street, I stopped very frequently to capture images of this quaint town. Who remembers the store, Woolworth the five and dime with the luncheon counter inside. My mother worked in a Woolworth’s in Pennsylvania when she was 16 years old in high school. 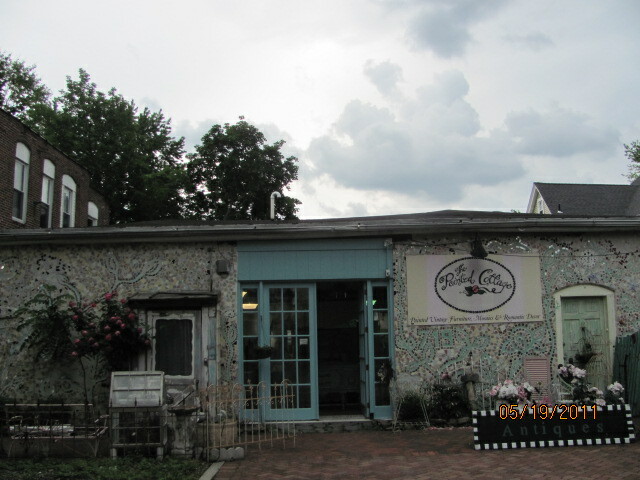 The Pop Shop, get your fountain sodas, malted and ice cream soda here! The Pop shop is also on Facebook and features daily specials. I wonder what today’s special is? A sneak peek of the menu. 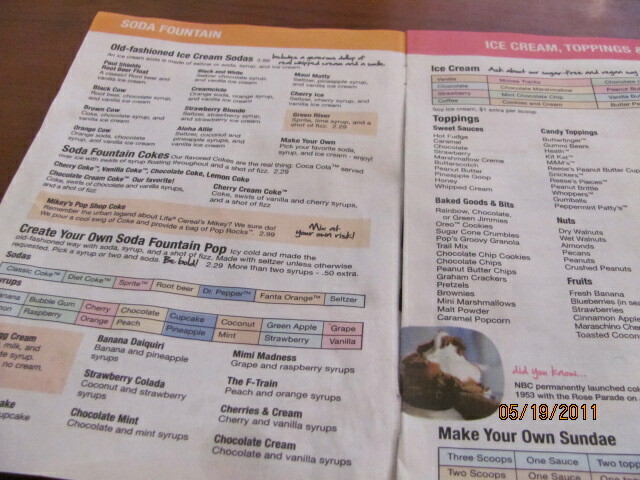 Which flavor syrup, and which soda will you choose, the combinations are endless! And a stroll down Main street! Pretty in pink, store frame window! 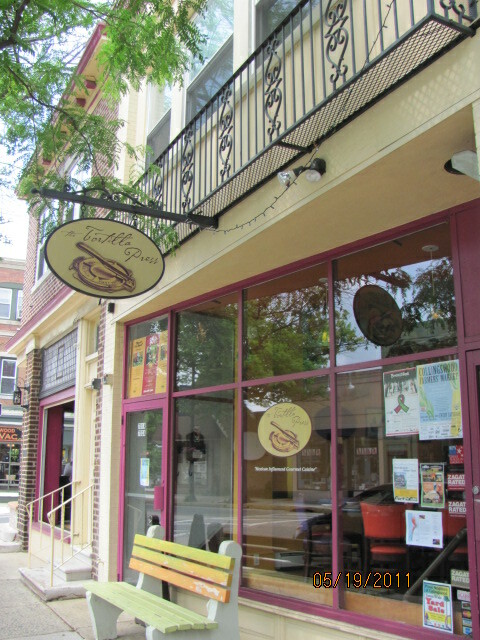 Step inside for a bite at the Tortilla Press. Now, continuing on our walk down the Main Street, I spotted a sign pointing down a pretty Alley; pretty as in pieces of porcelain tea cups dotted the walls of the building. The Sign said “The Painted Cottage”. Let’s take a look. Can you see the pink painted shutters? An antique store, can you see the pink? 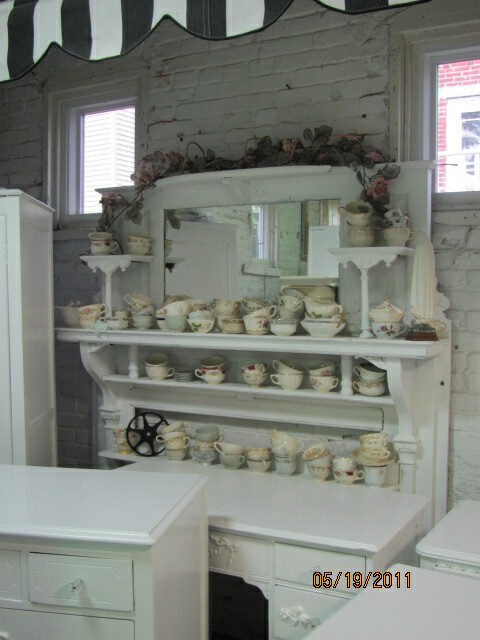 Once inside, you can see that the owner has sought out all kinds of furniture and has painted them in hues of all white or pastel blue. Oh my, how pretty, can we have one please. We could surely fit a small piece end table in our car. Let’s come back soon. Prettily painted, can you find the pink tea-cup? How do you like your oatmeal? I like mine in a cookie. Te he he. Where did that recipe disappear to? Oh well. Here’s another oatmeal cookie recipe that sounds even better. Yum, pumpkin-pie spice will be nice in a home baked cookie for fall, since back -to school time is right around the corner. Heat oven to 350°. Lightly spray cookie sheets with cooking spray. In large bowl, beat sugar, and vegetable oil spread with electric mixer until well blended. Add pumpkin, egg whites and orange peel; beat well. (Mixture will look curdled.) Add combined oats, flour, pumpkin pie spice, baking soda and salt; mix well. Stir in prunes and walnuts. Drop dough by rounded measuring tablespoonfuls about 2″ apart on cookie sheets. Bake 11 to 13 minutes or until lightly browned. (Do not overbake). Cool 1 minute on cookie sheets; remove to wire racks. Cool completely. For glaze, combine powdered sugar and orange juice in small bowl; mix well. Drizzle glaze over cooled cookies. Let stand until glaze sets. Store tightly covered. live’s in South Carolina, about 50 miles south of Charlotte, NC..around here we cook such things as beef hash, chicken stews, cooter stew ( snapping turtle) and catfish stews. I guess it’s a southern thing. Beef hash and chicken stew are poplar foods that are sold at local fund raisers, such as fire departments, churches and rescue squads. Beef hash is made in different ways and it depends in what part of the state you live in as to the way it is made. I guess have made a few thousand gallons of beef hash in my life time and I have my own way and style how I make it. I have tried to down size the recipe. Boil beef & pork until fork tender and remove from broth and let cool, then add onions, peppers and salt, add back to broth. Shred meat with a fork or fingers until it looks stringy and add back to broth. Bring back to a boil and then reduce heat to a slow simmer for about an hour, add more water if needed and keep the pot stirred from the bottom. Add vinegar and let it simmer for another 15 minutes. The last I do is add the butter, cut off heat and cover with a lid and let it rest for 30 minutes before serving. This great served over white rice. I did my best to down size this recipe, I usually make at least 20 gallon at a time.